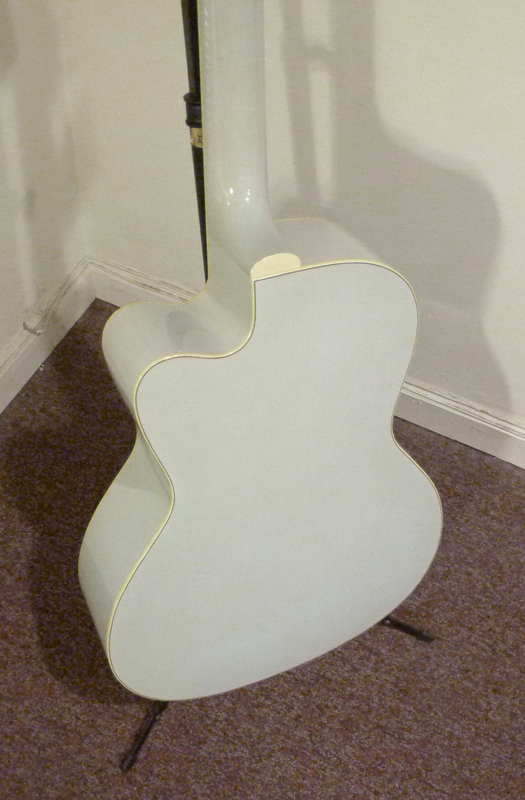 This was the 418th guitar built by Bill Collings. Having not looked at the tag when I first played this Collings C10 Deluxe Custom, I assumed its pale blue body was made out of maple, and that I would hear clear, prancing top notes with dry open prairie behind them. I got plenty of Collings clarity all right, but I felt plenty of power in the bridle, and I was happily surprised by the warm presence rising from under the low-mids, like the comforting waft of just-baked biscuits filling a ranch house kitchen. The back and sides are made out of mahogany, and that provides a dollop of richness to the otherwise clear and cheerful voice of this beautiful piece of luthiery. The top is made from very good Sitka spruce, my favorite top wood for mahogany, when it comes to accentuating its strength and subtle warmth. It is especially my favorite top wood for Collings mahogany, since the clarity and definition one looks to mahogany to provide is part and parcel of the default Collings build. The low bass string sounds with restrained authority that is a touch more potent than expected for a guitar with this body size. So it never gets lost in the crowd of solid notes that pop off the midrange strings and stay even with the chrome-plated trebles. That is, until the player desires some top-end flourish, when those treble strings blaze out from the edge of a strum like diamonds. 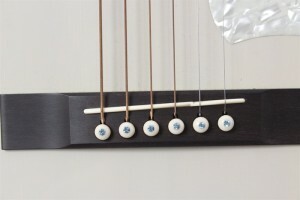 With string to string balance similar to an OM, it is well suited for fingerstyle playing. While the voice is not as wide as an OM or as beefy in terms of undertone or resonant swell, those leaner sympathetics help the fundamentals stand out with some muscle of their own, even as they retain focus and push forward with the gathered punch of a traditional 000 or L-00. But the long-scale brings it all up to the level of an OM when it comes to the marvelous projection and effortless volume. The guitar is simply much louder than its pretty and petite appearance suggests. For me, the 25-1/2″ string scale is the secret to the C10 success. The body is a bit narrower than an OM and a bit deeper, so it has a more-centered punch and a touch of that slightly tubby undertone fattening up the midrange strings of an L-00 (which has sides a little deeper than the C10.) But it is the long scale that puts extra energy into the strings, which then front-loads the voice with powerful projection. And that changes this guitar from a little wooden lap box suitable for country blues and parlor performances, into an instrument of serious versatility that not only takes to a heavy flatpick, it absolutely loves it. It embraced Duke Ellington and Hoagy Carmichael every bit as easily as it handled Leo Kottke and Libba Cotton. It was also none too shabby on unplugged versions of Jimi Hendrix and John Lennon. That being said, it still has some dryness to the overall voice, and can get as spanky as any dedicated delta blues machine I know of. This C10 Deluxe Custom plays like an electric guitar. Its dynamic response requires virtually no effort to send the voice out into the room, which relaxes the whole guitarist experience. But its the electro-glide playability of the neck that contributes to its mighty versatility. Stan ordered most Collings guitars with a 1-3/4″ width at nut, even back when they put 1-11/16″ necks on everything. But Collings was also the first top-shelf builder I know of whose 1-3/4″ neck was basically the same neck, only cheated out a little bit nearer the nut, where the player’s wrist operates at the most extreme angle. That meant their 1-3/4″ neck retained a narrower width and svelte shaping in the upper frets. This is now common practice across the industry, but no one does it as well as Collings. I used to think the neck on my 1997 OM1A had the best feel to it. But the C shape used for the C10 is slightly lower and smoother in terms of the barrel as it comes over the apex. This adds to the electric guitar feeling, as it is super-fast. Extra support inside the neck allows for the sleek carve without fear of stability issues, and permits a mere slip of a neck heel, which makes for delightfully easy access to the upper frets, especially when there is a cutaway, as in this case. The neck is also a big part of the Collings sound. They install steel on either side of the adjustable truss rod, which greatly increases the mass of the neck and reduces how much energy it can absorb or transfer from the strings. Bill Collings feels this channels more of that string energy directly into the body via the bridge and bridge plate. But he also uses a neck joint that offers a double bolt-on design in combination with a wide mortise and tenon that is similar to a traditional dovetail neck joint. And the resulting voice has qualities of both designs, offering solid fundamentals with the serious initial sustain typical of bolt-on style guitars, with some of the extra undertone presence, and the violin-like purity to the fundamentals and overtones heard in traditional dovetail style guitars. And so I would declare this guitar a serious winner even if had been blindfolded as it was handed to me to play. But one look is all it takes to see it is also a serious stunner. Stan Jay was a big fan of Collings guitars. He loved the purity in the voice and he especially loved the fit and finish of the high-quality construction. 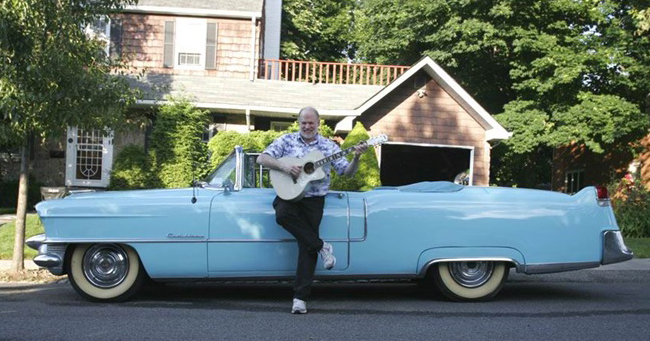 Stan considered Collings the Cadillac of acoustic guitars and he went so far as to order his own personal Collings with a custom aesthetic theme, based on his 1955 blue Caddie convertible with a white top, white interior accents, and creamy white wall tires. And so this guitar has Robin Egg Blue back and sides, an ice cream smooth top toned with what Collings calls Vintage White, offset with grained ivoroid binding that glows with a slight yellow hue, which may have aged naturally or came that way with some sort of vintage tinting. In any case, the binding actually looks similar to the shade of the white wall tires seen in this photo, where Stan plays his C10 while leaning against his car. 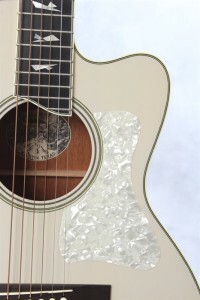 The fret markers are in the Collings’ Broken Glass pattern. The design was taken from the engraved pearl blocks that appear on the fingerboard of D’Angelico’s Excel model from the mid-1930s. But Bill Collings chose to convert that design to actual inlays. 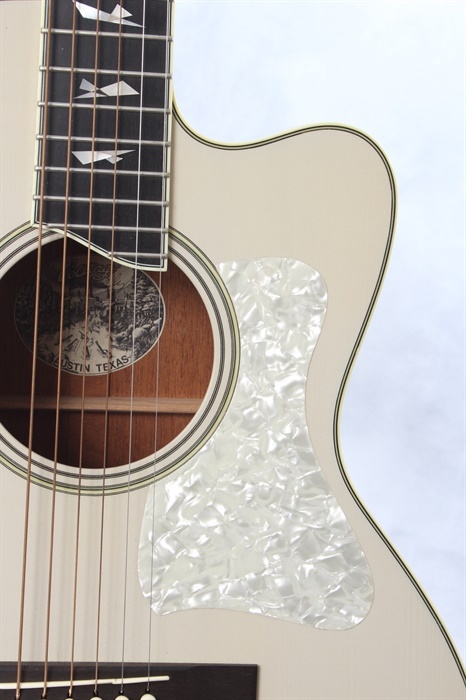 This expressive and dynamic pattern has been matched to a flamboyant headstock plate and pickguard slathered in luscious silvery white pearloid. The difference between a small patch of pearloid on a Les Paul crown inlay, and whole fields of the stuff used on this guitar is remarkable. Photos can’t begin to capture its amazing three-dimensional depth and highlights, like the rippling waves of butter cream cake frosting or the glinting whitecaps of a sun-drenched sea. I can’t decide if this guitar is more suited for the Roseland ballroom or the Grand Ole Opry, but the overall aesthetic comes together very well indeed. I do not normally go in for cowboy kitsch, rock n roll deco, or even the elegant tobacco sunbursts of the world’s most desired archtops. But I absolutely love this guitar. There is something so “retro” about it and yet quit hip. There is just the right amount of flash that is backed up with functionality and righteous tone. The combination of the C10 body shape with the long-scale neck, all that Collings power and clarity, the classic Collings sleek, fast neck shooting up into the soft cutaway, just makes me wish I was the person lucky enough to end up with this guitar. That it was made for a late, favorite friend only adds to this guitar’s mystique. It is the fact that it is a great guitar that leaves me longing. It sounds great, looks amazing, and is a dream to play. It will stand out in any collection, but would also add an air of panache to any stage show. It would be just the thing for my current gig as sideman in a guitar trio fronted by a retired Broadway actor who sings as much Gershwin and Fats Waller as he does Bob Dylan and Bobby Darin. Between the panache, presence, and playability of this Collings C10 Deluxe Custom and the stratosphere price appearing on the 1931 Martin OM-28 hanging in the same room at Mandolin Brothers, I think it is time I went out and bought a few lottery tickets, don’t you?